In order to honour all of the Australian and New Zealander soldiers who served their country and died at war on the 25th April in 1915 in Gallipoli – I have constructed a healthier version of the traditionally crunchy and oaty Anzac biscuits. Kept all of the flavour but none of the butter, white flour, sugar or golden syrup like traditional Anzac biscuits. I have tried and tested and finally perfected a recipe that tastes just as naughty as the store-bought biscuits, but without sending your blood sugar levels on a roller coaster or compromising a slim waistline. I have kept the oats quite chunky to achieve the texture of traditional Anzac biscuits. Oats have incredible health benefits and are regarded as one of the healthiest grains in the world. Oats are a great source of complex carbs and fibre, including the important soluble fibre called beta-glucan. Oats are also full of essential micronutrients including manganese, phosphorus, magnesium and Vitamin B1 and B5. Soluble fibre means that this type of fibre slows down food transit in the intestine – meaning that it takes longer for the body to digest food. As digestion is slowed down, the body does not absorb sugars as quickly and therefore reduces the chance of blood sugar spikes. Beta-glucan fibre is highly effective at promoting heart health and improving cholesterol levels and reducing type 2 diabetes risk. 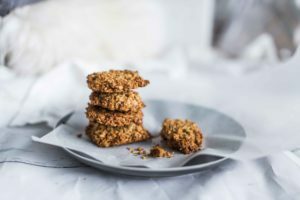 Adding coconut not only does it gives these Anzac biscuits their delicious nutty taste, but also provides a realm of minerals that support healthy connective tissue, support for brain function as well as increased iron, fibre and healthy fats. I also included almonds to boost the health benefits as well as sneak in some additional protein! Almonds are more than just a tree nut – they are bursting with nutrients. Just one small handful of almonds contains 3.5 grams of fibre, 6 grams of protein and 14 grams of fat and are high in copper, riboflavin and phosphorus. The addition of almonds packs in vitamin E, healthy fats, magnesium and antioxidants. I love using ghee when baking as it is full of fat-soluble vitamin, healthy fatty acids and it is a stable source of fat. Ghee is produced by heating butter to remove the milk solids and water. You can check out how to make it here. It contains several fatty acids that are important for our health. Ghee is perfect for cooking and baking as it has a high smoke point, which means less risk of destroying important nutrients when used at high temperatures. Ghee helps boost the body’s uptake of fat-soluble vitamins including Vitamin A, E and K which assist in improving vision and healthy glowing skin. The addition of ghee to these healthy Anzac biscuits helps to improve digestion and reduce inflammation, while also adding a lovely buttery taste. Always remember with baked treats around – portion control is a must! Savour and enjoy 1-2 biscuits with a hot mug of my anti-bloating sweet tea (click here for the recipe) and share them with friends and family – they will be grateful! Preheat your oven to 160C (320F) fan-forced bake. Place the oats, coconut and almonds in a food processor and blitz for 5 seconds. Add the ghee, rice malt syrup, vanilla extract, stevia, baking soda, chia seeds and spices into the food processor. Turn on the food processor and blitz for about 15 – 30 seconds or until well combined. Add the water and process again. The addition of water helps the cookie mixture clump together nicely. Due to the chia seeds absorbing a lot of moisture, if it still looks a bit dry add another tablespoon of water. Using your hands, scoop the mixture into 12 rounded cookies and place onto a baking sheet lined with baking paper. Flatten down but leave enough room around each cookie not to touch each other.